The Zhou were Western neighbours of the Shang and conquered them in 1027 BC. The Zhou maintained many Shang practices, although they did introduce feudalism to reward the many who had served them in their victory. 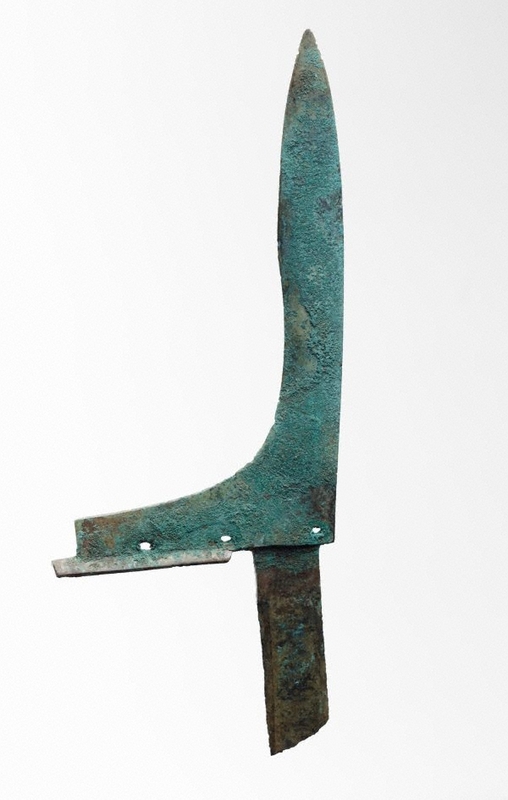 Warfare was a fact of life in ancient China as evident by the large quantities of weapons that have been excavated. The 'ko' dagger axe is the characteristic weapon of Shang and Zhou. It developed out of earlier stone prototypes. Some of the stone weapons and artefacts used in prehistoric China were common to all neolithic peoples of Asia, but others, like the 'ko' were of purely Chinese origin. The 'ko' also had ritual significance as demonstrated by Shang specimens with jade blades. Jackie Menzies, 'Early Chinese Art', AGNSW, 1983. cat.no. IV (b). Early Chinese Art , Sydney, 1983, not paginated. cat.no. IV See 'Further Information' for text.